Conditions that refractories must withstand vary a great deal from one application to another. One especially difficult condition occurs during the firing of glazed ceramics, when some of the alkali vaporizes at firing temperatures. These vapors react with some refractory products. 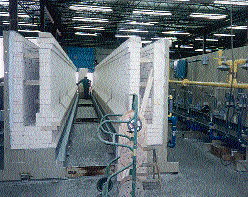 In kilns firing various whiteware products, Swindell Dressler International Co. has seen alkali attack on conventional 2600°F classification (ASTM Group 26) insulating firebrick (IFB). The effect is usually not enough of a reaction to “salt glaze” the lining, but the resulting shrinkage on the hot face can cause a network of shrinkage cracks and spalling. Pieces of spalled refractory falling on glazed ware result in high reject rates. The ASTM C-155 standard classification for IFB establishes a maximum bulk density limit and a reheat change maximum of +/-2% when tested 5000°F below the temperature rating. The maximum bulk density assumes low conductivity or good insulating value. The reheat test ensures suitability at the temperature rating but only with nonaggressive atmospheres. There are no specifications for chemistry or dimensional changes other than the reheat test. The maximum density for a Group 26 is 54 pounds per cubic foot. There are several ways a manufacturer’s Group 28 IFB may differ from its Group 26 IFB. From some suppliers, Group 28 IFB have the same chemical composition as Group 26 IFB. The only differences are higher density and firing to result in an acceptable 2750°F reheat shrinkage. This offers no significant improvement to Group 26 IFB for resistance to chemical attack. Other suppliers manufacture a Group 28 IFB that are lowfired. These pass the 2750°F reheat shrinkage test by relying on expansion during mullite formation to counteract the high-temperature related shrinkage and allow the net change to be in the +/-2% range after the reheat test. If the IFB are heated only into the temperature range to experience the mullite formation and below the temperature where shrinkage occurs, they expand as much as 7%. A large tunnel kiln cannot accommodate these large dimensional changes, even if chemical attack does not occur. Some Group 28 IFB are both high-fired and of a higher alumina composition. The chemistry might appear to be more suitable to the alkali-rich atmosphere; however, high alumina content is not always an indication of alkali resistance. Prefabricated side wall sections of a sanitaryware tunnel kiln before shipping to the job site. BNZ 26-60 IFB is used on the hot face and BNZ 2300 HS IFB is used as back-up insulation. Some of these have a high free-silica content. This is thought to be more reactive with alkali vapors. The higher thermal conductivity is also a drawback. (60.4%) was chosen to withstand the combination of temperature and atmosphere. Special raw materials and firing conditions were also selected to yield high mullite content and low free-silica content, as manufactured. The result became a specialty grade (BNZ 26-60) that meets the ASTM C-155 specifications for group 26.
specialty-grade brick has lasted three times longer before cracking compared to the conventional material. 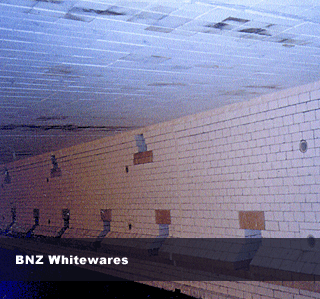 This specialty grade has been adopted by Swindell-Dressler as the standard hot zone lining material in its tunnel kilns for sanitaryware, tile and other whiteware applications. This commitment to using quality materials has helped Swindell Dressler become one of the largest suppliers of kilns to the sanitaryware industry in the world, supplying kilns to 10 countries on four continents.